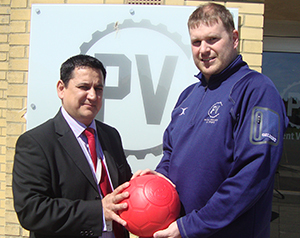 L-R. Mr Layland, Senior Leadership Team, Mr Reygate, Head of PE, Pent Valley, PFP Project Manager with the Peace Fields Poppy Ball. 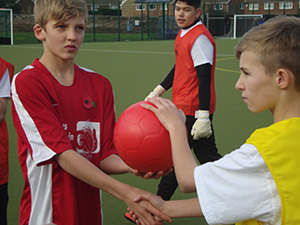 Kent and Flemish Schools remember WW1 Christmas Truces through football. Students from Pent Valley Technology College in Folkestone and Thamesview School in Gravesend were joined by Middle School and Provincial Technical Institute from Ypres in Belgium, they played football matches to mark the centenary of the games that took place during the World War 1 Christmas Truces – in a project backed by Prince William. The match was part of the Football Remembers project from the British Council, The FA, the Football League and the Premier League – which will see every level of football mark the anniversary in a week of commemoration. 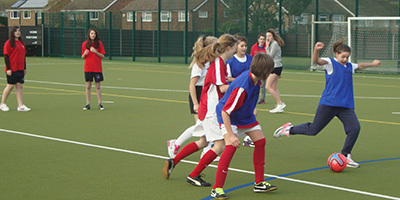 Over 70 Students from across the four schools participated in a number of learning activities together related to the Christmas Truce before playing a football tournament which commenced after the Last Post which was played by one of the students before kick off. The schools are currently working together in a European Funded Comenius Regio project EASIER – Facing the Great War where the students from the two countries are researching their shared history of the Great War. At the end of the matches all participants received medals and the students exchanged gifts, in the spirit of the Christmas Truce. Jim Cadman, author of The Black Football Heritage Book, in partnership with The National Children’s Football Alliance, donated a copy of the Heritage Lottery Funded book to each participant. The book features one of Folkestone’s First World War heroes Walter Daniel John Tull who was the first ever black outfield player to play professional league football. During the First World War, he served in the Middlesex Regiment and fought at the Battle of the Somme in 1916. He was commissioned a Second Lieutenant on 30th May, 1917. Tull was commended for his gallantry and coolness whilst fighting in Italy leading 26 men on a raiding party in enemy territory. He was killed in action on 25th March 1918. 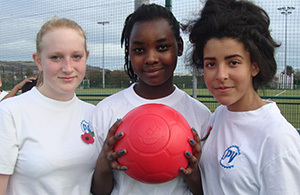 Each school also received a One World Peace Field Poppy Ball as a memento of the centenary event. The One World Flanders Peace Field Poppy Ball that kicked off the first of many events to commemorate WW1 and celebrate peace. The schools marked the occasion by tweeting a photo of the two teams standing together with the hashtag #FootballRemembers and the name and location of the school. Their image will be featured on a special website – www.footballremembers.com – where it will sit alongside photos from teams across the country, including some of football’s biggest names. The website will be a permanent tribute to the soldiers who laid down their arms on Christmas Day 1914. 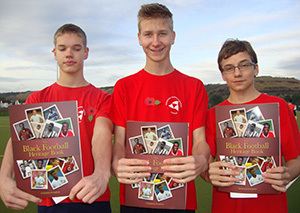 The students have been learning about the Christmas Truce with the help of a Football Remembers education pack, which more than 30,000 schools across the UK received in May. It includes resources to help children learn about the Truce – including eye-witness accounts, photos, drawings and letters from soldiers some of which have never been published before.